A few weeks ago, I got a network attached storage device (a D-Link DNS-323 if you want to know) and it works perfectly with Mac OS X and Linux. I must have transferred more than 500Gb to and fro up to now without any glitch. Yesterday, I was feeling bored and I decided to boot into Windows XP (I have it on one computer and I have stopped using it) to see if the NAS works well with it. The initial connection went well but I got a Blue Screen of Death (pictured above) during transfer of data. I rebooted the PC in Windows and tried again. Once more I got the BSOD. I wonder what normal people do when they get a BSOD? Do they contact their system administrator or technical support group as advised? Or do they just reboot and pray that the problem will go away? Personally, I only have to reboot the PC and, after a few seconds, something magical happens: the Linux login screen appears. This is when I realise how lucky I am. That’s bizarre. I have never used a NAS pesonally, but one of colleagues has a D-Link NAS which he has been using with his Windows computer without BSOD. The only thing he complains about is how slow it is. I use all of them. Although I like OS X a lot, I don’t like Apple’s approach of denying an existing problem until a huge number of people start complaining about the problem. Random Shutdown on first generation MacBooks is an obvious example. And Apple took quite a long time before patching the Java vulnerability. We can say that Windows has a lot of flaws, but they do work on fixing them quite rapidly. You’re right. Every OS provider (including us — OSS guys and girls) work hard to make things work as seamlessly as possible. The thing is, I wonder, giving the prevalence of BSODs, what users generally do when they have one? I think most people just reboot and pray. This is somewhat different in the Linux world where people are more inclined to read logs and try to troubleshoot. I would like to add that not everything is better on the Linux and Apple side. On the Mac side, watching a YouTube video will make my MacBook’s fan go crazy. This does not happen on my wife’s Vista computer. On the Linux side, I’ll admit that Linux has made huge progress over the years. However, more progress still needs to be made. Open Office is not MS Office. The grammar check and spell check will not satisfy many “normal” users. And let’s face it, the interface is not the most beautiful either. Good looking interface is part of the whole computing experience. This is what OS X is praised for. I’m not a fan boy of any platform, although at the beginning I was becoming an Apple one. I’m just saying things like I see them. This is somewhat different in the Linux world where people are more inclined to read logs and try to troubleshoot. Yes, it’s fun at times to troubleshoot and see how things work fine after. But, even geeks tend to move to the other (bright or dark?) side sometimes. I try to find solutions which can be implemented via the GUI in Ubuntu as much as I can. My printer is shared via my Ubuntu box. I don’t want to have to walk my wife through using the Terminal if she calls me at work because she cannot print. The BSOD points towards a bad NAS driver – Mup.sys? @Patrick: If I didn’t have a MacBook, I would have done everything using Linux (I use CentOS at work and Mint at home.) In fact, my parents, who don’t know much about computers, have been using Ubuntu exclusively for 1 year now and everything works great. @Carrotmadman6: MUP.SYS is written by Microsoft… I didn’t have to install any driver for the DNS-323 as the transfer is done over SMB. 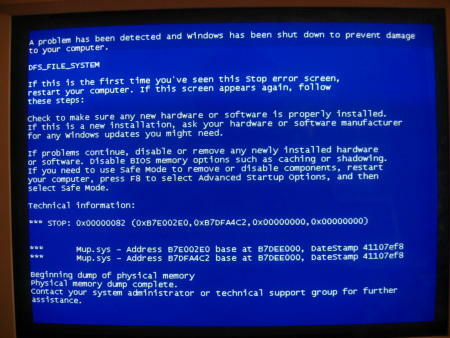 Ahh.. good old BSOD! They could have made it prettier in 7/Vista.. but its the same..
By the way, since you’re a former lecturer, do you understand those technical info like address in HEX and other blablas? In fact, my parents, who don’t know much about computers, have been using Ubuntu exclusively for 1 year now and everything works great. 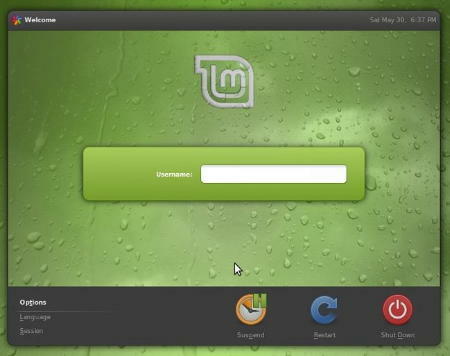 For “normal users” like you said, a base installation of Ubuntu or CentOS will probably suffice. I’m pretty sure my mum will be happy with that too, especially since a virus attack is virtually non existent. She will be able to use Skype instead of MSN Messenger for videoconferencing. But, for those who make a living writing, specially in French, then I think the default word processor–Writer– is pretty weak as far as spell check, grammar check and dictionaries are concerned. Moreover, for those who write a lot in French, “Le Nouveau Petit Robert” is a must. While the paper version is nice, the electronic version can save one a lot of precious time. Unfortunately, the electronic version works on OS X and Windows only. It’s sad, but that’s the way things are at the moment. You’re right about Writer being somewhat lacking when writing in French. The dictionary is not bad (when it is installed of course which is not always the case) but the lack of grammatical correction in the default installation is problematic.